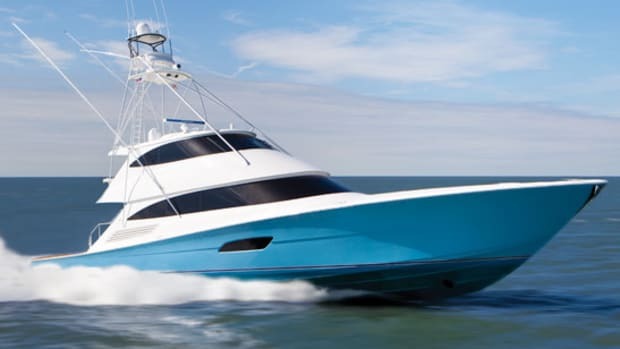 Even though she’s the baby in the Viking line, the 42 ST packs a big punch when it comes to fishing and cruising, and you might just find she’s all the boat you need. 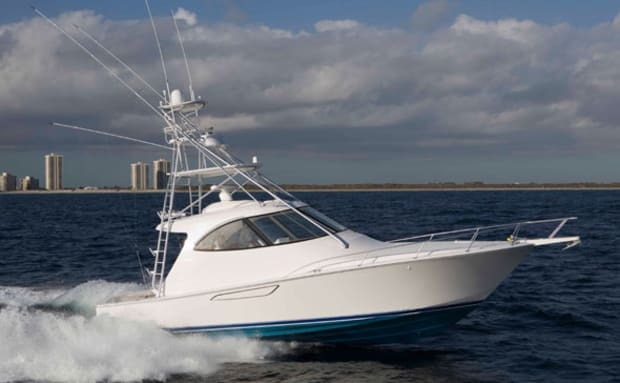 If you’ve been to any of the major American boat shows in the past few years, you have undoubtedly become familiar with the sight of the Viking 82 Convertible. Massive, sleek, and always prominently positioned, the boat is near impossible to miss. 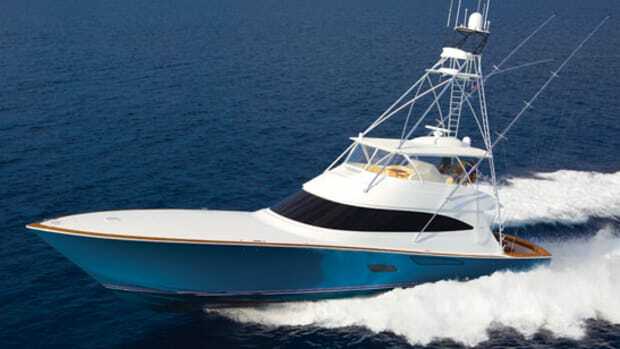 And with the highly anticipated 92 Convertible set to launch at this year’s Ft. Lauderdale show, you could be forgiven if you were operating under the assumption that Viking is putting all its eggs in the big-boat basket. But that’s simply not true, as evinced by the company’s launch of the sisterships 42 ST (Sport Tower) and 42 SC (Sport Coupe) last year. I recently tested the fishier version of the duo, the ST, off of Palm Beach, and was pleased to find a punchy, versatile sportfisherman with cruising and angling amenities to spare, a soft ride, and admirable maneuverability thanks to her Zeus-pod setup. The 42 ST is essentially designed for three distinct purposes. One is as a tender, usually for an 82. In that case, the 42 is often used expressly as a fishboat, while the 82 acts as a mothership. One Viking client who uses his 42 as such actually uses the sizable amidships VIP stateroom for rod stowage exclusively. His captain sleeps in the master, and everyone else has a berth on the big boat. 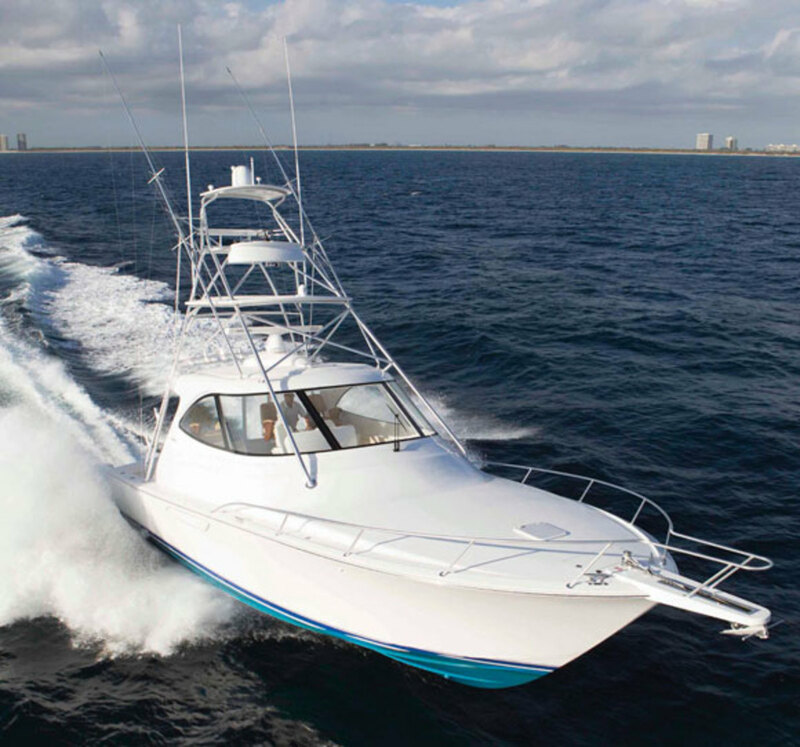 Another way Viking sees its clients use the 42 is as a low-maintenance boat to be kept at a second home. 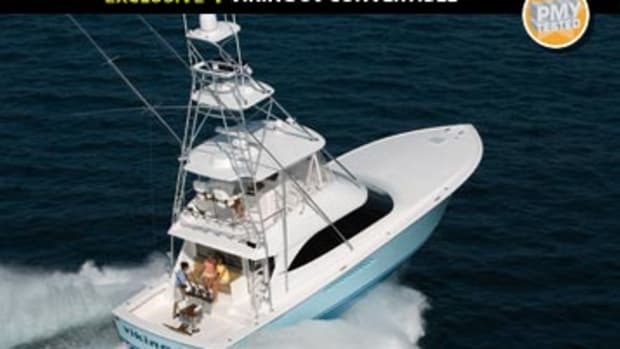 With an LOA of 42 feet, 7 inches, the vessel is comparatively hassle free to clean, while also being the perfect size for cruising with friends, diving, fishing, and other activities commonly associated with waterside vacation homes. 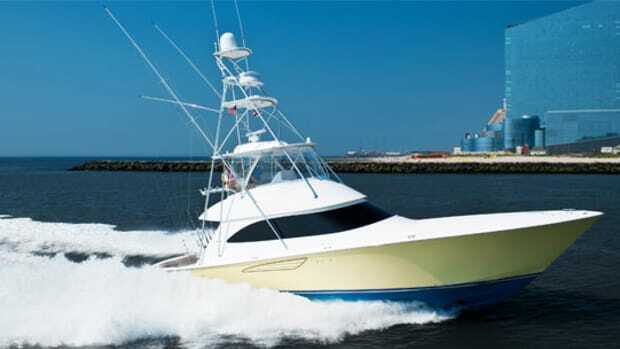 Like most Vikings, the 42 ST is equipped both for cruising and for fishing. On the bridge deck, there are three forward-facing Release Marine chairs, including the helm chair. For anybody who’s ever cruised in sizable seas, you know having a stable, comfortable, forward-facing seat can make all the difference. What’s more, the seats rotate completely so passengers can keep an eye on the fishing action, a nice touch. That helm sports a fiberglass teak-veneer helm pod that I originally thought was the more expensive—and more fragile—fully teak helm pod Viking has on some of its other boats. Either way, whether teak or faux teak, it’s simply a beautiful accouterment for a boat. 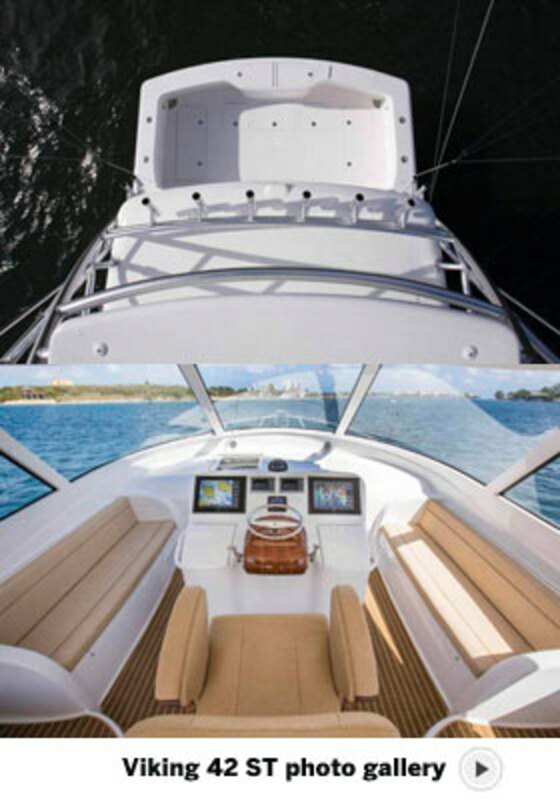 Just forward of the pod, twin Garmin GPSMap 8215 screens as well as twin SmartCraft VesselViews help keep the captain in touch with his surroundings and the fish. 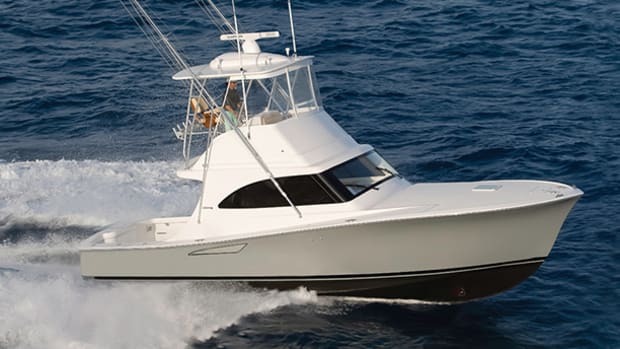 Down below Viking offers three layout options, all of which have a forepeak master with private access to a head and loads of stowage in nearly every cranny, as well as an amidships VIP with twin berths. A three-stateroom option offers bunks in a cabin to port, while the two-stateroom options have either an L-shaped settee occupying the same space or a bench seat with a second head. For most people, I’d think the two-stateroom, two-head layout would make sense. After all, why not substitute a small piece of couch for a second head, the payoffs in privacy are huge. 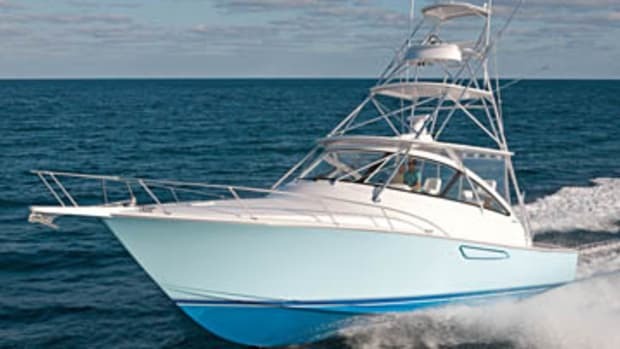 As for the three-stateroom layout, it may make sense if you are fishing this boat in tournaments, or spending lots of time onboard with two other couples or another couple and some kids. As for the fishing amenities onboard, the namesake tuna tower is manufactured by Viking subsidiary Palm Beach Towers. Considering this isn’t a convertible and your view of the fish could at times be less than optimal, that’s an important feature. 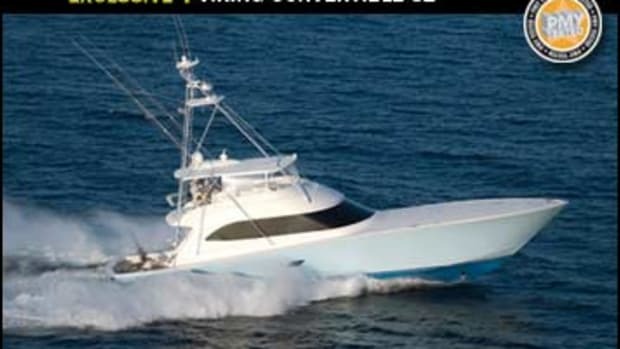 In addition, the wide, open cockpit has more than enough space for anglers to maneuver around one another when the bite is on, and there are twin in-deck fishboxes to port and starboard, as well as another fishbox in the transom that is fitted out to double as a livewell. Freezers in the mezzanine work well for bait or for any extra provisions if you’re going for an extended cruise. Twin recessed tackle boxes, also in the mezzanine, mean you’ll never be fumbling for gear at precisely the wrong moment. After giving the boat a proverbial kick in the tires at the docks, I was able to take her out through Lake Worth Inlet and into the Atlantic. Conditions were blustery, with confused 3- to 4-footers and occasional explosions of rain from above—so basically, it was South Florida in springtime. The Viking ate it up. She crested the bunched-up seas in the inlet again and again, always landing with a feathery entrance into the water thanks to her modified-V hull with 16.5 degrees of deadrise at the transom. Her twin 600-horsepower Cummins QSC8.3 diesels trained to Zeus pods had her motoring comfortably at a brisk cruise around 29 knots, no small feat when you consider conditions were bad enough to stop us from recording accurate WOT speed numbers. So I can assure you that you can rely on that 29-knot cruise, particularly if you happen to be trying to beat the tournament bell and Mother Nature isn’t cooperating. And even better, the ST ran at that speed without so much as a creak, and exhibited agreeably modest trim angles throughout her rpm register thanks to her Cummins autotab function. The 42 was a pleasure to drive at speed, but the best was yet to come. At slow speeds, the Mercury SmartCraft joystick had the 42 spinning like an Olympic figure skater, and moving laterally with real acceleration and surgeon-like precision; two inarguably impressive and useful attributes when you’re trying to land a trophy fish. 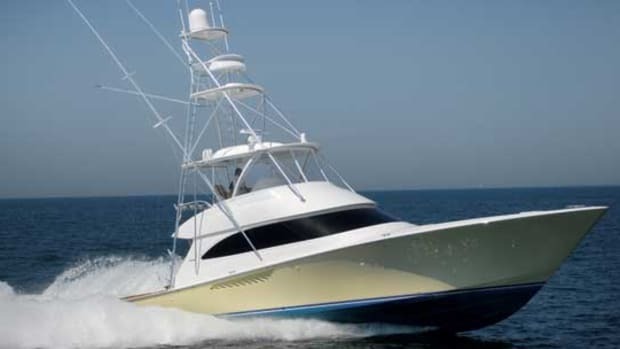 The 42 might be the smallest boat Viking is currently offering, but the boys in New Gretna packed her to the gills with everything you’d need to enjoy her in full. 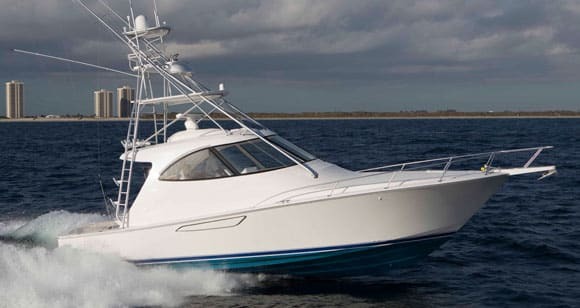 Whether you’re cruising her or fishing her, with that seakindly ride, slow-speed agility, and onboard amenities to rival even the largest of her sisters, the Viking 42 ST is a boat you should have your eye on, even if you have to look just a bit harder to find her. 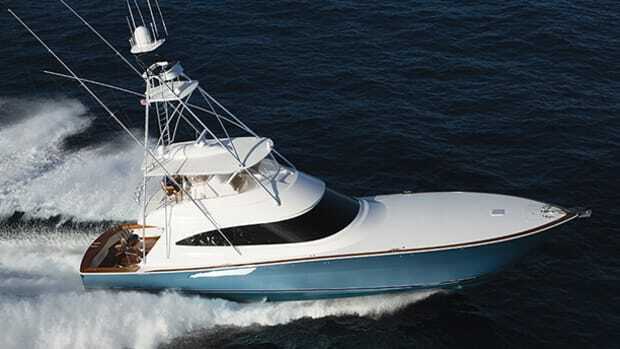 NOTEWORTHY OPTIONS: Teak-finish fiberglass helm pod ($4,260); Release teak helm chairs ($5,675); Palm Beach tower ($69,228); Atlantic Marine electronics package ($57,211); Helm a/c ($12,925); Lumishore underwater lights ($3,698). No fishboat worth its salt is complete these days without a tuna tower. Viking knows that, and knows it well. So well, in fact, that it has its own subsidiary, Palm Beach Towers, that builds towers for its boats as the boats themselves are being built. That saves their owners time on the delivery, as the boat and tower get to them in one piece, and ready to go. 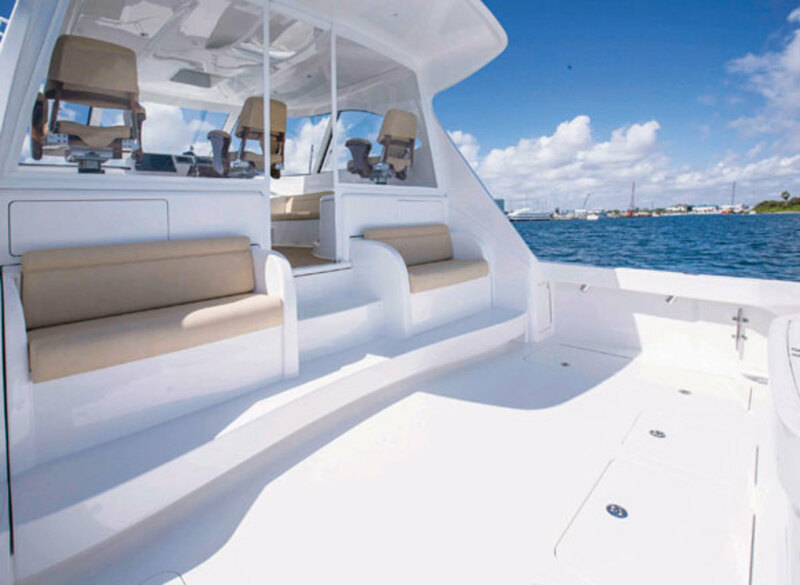 Mezzanine seating, like the kind seen on the Viking 42 ST, has become de rigueur in the world of sportfishing, and if you’ve ever been fishing on a boat with a mezzanine, you know why: There’s simply no better seat in the house to watch the action. Somewhat ingeniously, the design also allows for tons of extra stowage. In the 42’s case, that means extra freezers and recessed tackle boxes are always within easy reach of men at work. The heart of any boat is her engine room. And you can’t get out to the fish, and more importantly, home again, if your ER is in bad shape. 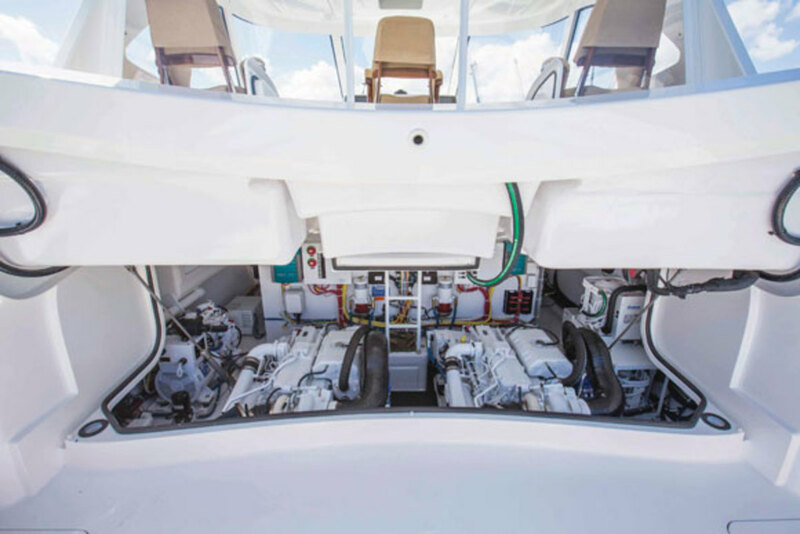 The 42’s twin 600-horsepower Cummins diesels are housed in an almost shockingly large space accessible via a companionway in the mezzanine. Dual Racors show a reassuring bent towards redundancy while white Awlgrip throughout will help the captain immediately spot oil spills. Even better, everything is labeled and orderly, meaning that if something does go wrong—Murphy’s Law is a thing for a reason—you’ll be in the best possible position to fix the problem. This article originally appeared in the June 2014 issue of Power & Motoryacht magazine.